Two teenagers have been convicted of killing a man who fled, fatally hurt, in a taxi after a stabbing attack. Zachary Lemonnier, 18, was found guilty of murder and co-defendant Robert Williams, 18, was convicted of manslaughter. The attack in Milton Keynes left Ronnie Wrighting, 29, with a deep stab wound that had severed major blood vessels, Luton Crown Court heard. Judge Andrew Bright QC will sentence the two men on Tuesday. 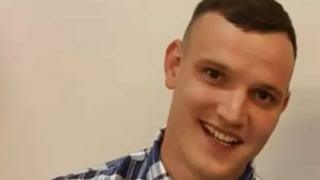 Prosecutor Martin Mulgrew said on 11 August last year, Mr Wrighting was waiting in Duparc Close for a taxi to take him home to Great Linford at 22:15 BST. Lemonnier arrived riding a moped, with Williams on the back, and residents said they "rained blow after blow" on Mr Wrighting. The taxi arrived and Mr Wrighting got in but the knife had caused a 6in (16cm) wound which severed major blood vessels and had cut his kidney "almost in half", the lawyer said. The victim was unaware of his injuries but during the taxi ride he became increasingly unwell and he struggled to get out of the vehicle and could not talk. The internal bleeding caused cardiac arrest and he was pronounced dead at Milton Keynes Hospital, the court heard. Lemonnier told the court Mr Wrighting was massive and had just thrown his friend to the ground like "a rag doll" and "I stabbed him". He denied intending to kill him and said: "I was protecting my mate. I thought my friend could end up in hospital. "Nothing had any affect on him at all." Lemonnier, of no fixed address, was convicted of murder and having a knife in a public place. Williams, of Browns Wood, Milton Keynes was cleared of murder but found guilty of manslaughter and having an offensive weapon.